What food do you think black garlic would go well with? Comment below. 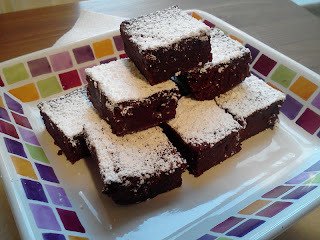 I used a recipe from Dorie Greenspan as the base because I wanted it to be rich and chocolatey. I, also, used a whole bulb of the black garlic. The result was a very strong "meaty" aroma-ed brownie. I really liked the result, but the interesting thing was the feedback I got from blind tasters at my office. The first thing my tasters noticed was the pungent smell. In fact, that's where the term of "meaty" came from. One person even said, "I'm not sure if this is meant as an appetizer or a dessert." Some could identify an oniony smell, but were trying not to follow that thought since they were holding onto a brownie. First bites were also fun to watch.It seemed to take people a moment for their tastebuds and brains to react. After all, they are expecting chocolate goodness, not this odd additional taste. I asked them to identify what flavors they could get from it and then whether they thought it was too strong and needed to be toned down. A few people did say that the garlic overpowered the chocolate instead of accenting it. They voted for at least halving the amount I put in. The flavor characteristics that were described were: meaty, smokey, oniony, umami, balsamic, and one even guessed the garlic. Only a couple of people said that they didn't care for it at all. Most said that after the initial shock of it not being what they expected, the flavor grew on them and it worked. So, with that information, you will need to decide how much you are willing to put in your own batch. My personal opinion is that the aroma was so strong and the flavor did completely cover the chocolate flavor, and so the recipe below calls for half a bulb instead of a full bulb. GF Note: For those unfamiliar with my blog, I do not have any dietary reason that I need to eat gluten-free. I choose to bake gluten-free within my home because I have an interest in all the other types of grains and flours that have been used by cultures for centuries. Why is America so wheat focused? NOTE: The below recipe can be made either with flour or as gluten-free (which I actually prefer). Please pay attention to the instructions. 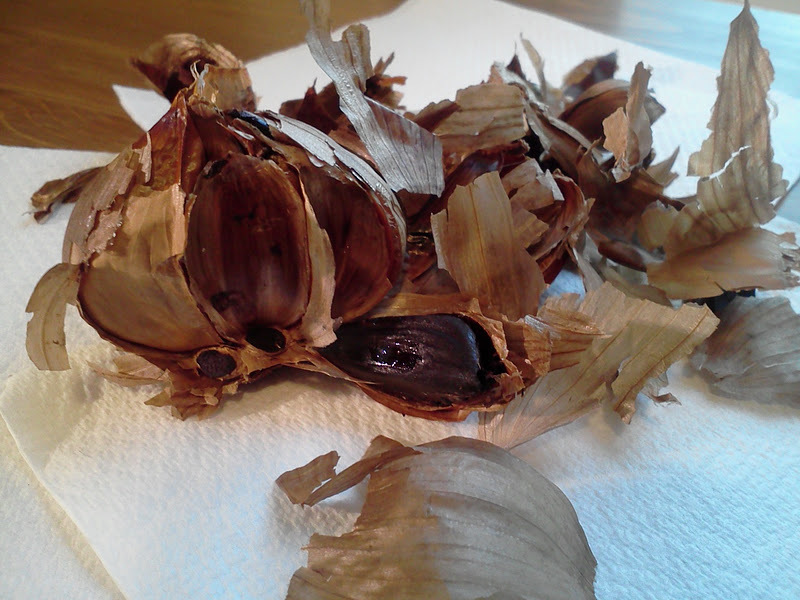 In a small bowl, use a fork to mash thoroughly the black garlic into a paste. Add the garlic, vanilla, and salt to the batter and mix thoroughly. Pour batter into pan and spread evenly, smoothing top. Bake in oven for 25 minutes or until top has a dull finish and a tester comes out smoothly. Cool on a rack.